I guess, I’m growing up. Moving away from carbonated beverages and sugar candy to a healthier lifestyle (at least thats the goal). Aerated drinks are replaced with a fine red wine or lemonade, iodized salt replaced by rock salt, the changes are steady. Growing up, I never really understood the value of a good old fashioned home cooked meal till I was away at boarding school. One never really appreciates a good thing till its scare, rather gone. And all those memories came flooding in when I visited Saraya in Sangolda (what I would later closely describe as an untouched Shangri-la in the making). What affirms my belief is the simple no frills attached sales pitch- home soul food cooked with love amidst nature. It gets better, the menu is entirely vegetarian and there is NO alcohol served.From the farm to the table so to speak. Now before many of you run through the door (I did initially as well) I urge you to scroll further. Before I get to my showcase piece de resistance of wholesome goodness encompassed in a plate- the type of goodness to give you goosebumps and bring a smile to your face that would put the Joker to shame, I must highlight the most awesome inspired menu from the words of the owner/chef Deeksha Thind, that struck a chord deep within. After all how does an Aloo Paratha sit comfortably on the same menu next to a mud baked wood fired oven mushroom three cheese caramelized wheat based pizza or breaded mushrooms stuffed with butter garlic cilantro & topped with cheese roll with a bruschetta made of local poi toasted with butter garlic topped with fresh basil leaves served with homemade herbed tomato sauce; all in the blink of any eye without raising a gastronomic faux pas. (try reciting that sentence in a single breath, I dare you…) If you are parched and gasping cool off with their wide array of juices that would given mixologists some food for thought such as the Lemonana (a cool freshly squeezed lemon and mint combo) or the pineapple mint. If you need something to soothe your throat do sip into their orange and ginger lemon mint juice. Deeksha smiles and elaborates- “all my food cooked is inspired from my kids growing up. They were my muses. Whenever they wanted something I would make them get to work on the mise en place (chopping onions to peeling potatoes everyone had to pitch in) and would get cracking on the preparation of the same. It’s all their favorites.” All the food is cooked in extra virgin olive oil and most of the veggies are organically grown in her backyard. Don’t take my word for it- the meal needs to be consumed to witness the fresh wholesome goodness each bite brings. Since I am the lone rider on most of my jaunts, Titli (her daughter) played gracious host to the evening amidst keeping the dogs at bay to wayward patrons who needed a quick affirmation on dining options. The dogs I assure you, are harmless and Falafal (yes thats her name) is my favorite (especially when she plays curious wannabe taster on hind legs..For all non-animal lovers, fear not – a system is being initiated wherein they assure you a dog free dining experience as an option) And right there and then, the simple concept of a utopian, bohemia- a harmonious surrounding where all elements coalesce unpretentiously is something that gets me. Like that very moment Leonardo Dicaprio finds the island in Danny Boyles ‘The Beach’, that moment when he sinks face deep into the sand, exhausted yet fulfilled. 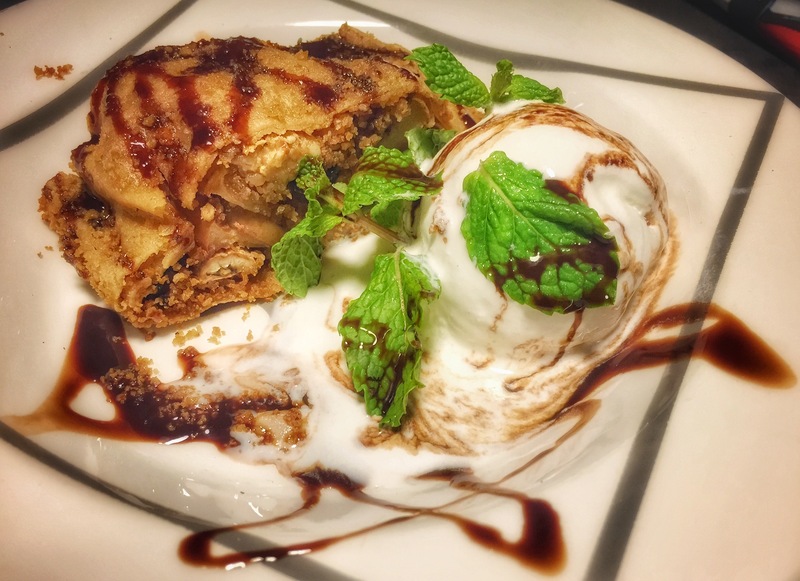 While Deeksha excuses us to keep an eye on the preparation of their ever evolving famous Apple Strudel; I am in dimensional deep conversation with Titli – an aspiring writer and airline pilot, wherein she elaborates the ‘ethos’ about the place. If you ask me its quite articulately captured in the way Saraya presents itself- concept wise (read quote below). Imagine if we lived among them ; if we never cleared out those magnificent , beautiful extensions of the earth that we call trees and the entire Eco system that is sustained by them? Remember that universal dream when we were growing up ? – A TREEHOUSE ! A playground filled with mystical magical fireflies and butterflies and grasshoppers that we so innocently liked to put in old jam jars to observe – but then release when our curiosity was no more. The Apple Strudel the english loanword from German, is homemade wheat puff pastry (which has undergone a reinvention from readymade puff pastry used earlier) caressingly rolled around a bed of brown sugar caramelized gooey banana, topped with apple & pear with a dashes of cinnamon mixed with peanut butter and drizzled sparingly with gold and black raisins. I love the interpretations this orgasmic dish works at every single time I visit, much like candy land- the star attraction this time being the peanut butter replacing fresh strawberries and black grapes earlier (seasonal as they are). Did you know: Traditional Hungarian, Austrian, and Czech strudel pastry is different from strudels elsewhere, which are often made from puff pastry.The traditional strudel pastry dough is very elastic.The dough is worked vigorously, rested, and then rolled out and stretched by hand very thinly with the help of a clean linen tea towel Purists say that it should be so thin that you can read a newspaper through it. A legend has it that the Austrian Emperor’s perfectionist cook decreed that it should be possible to read a love letter through it. The thin dough is laid out on a tea towel, and the filling is spread on it. The dough with the filling on top is rolled up carefully with the help of the tea towel and baked in the oven. Be mindful of time in this place, as it has the power to arrest you and transport you into the lap of nature with nurturing home cooked food. Dance with the butterflies till we next meet.